It isn't an easy thing this New Year deal. We speak of letting go the old and bringing in the new. This means everything that happened last year is to be taken with a grain of salt, or left behind, lost to the memory or given to the cache of lessons in life. It is harder than it appears. Many of us have lost loved ones this past year, or many have lost a love affair, or a job, their homes, many many other issues that were "NOT HAPPY." The new year promises a whole chance at getting it together again, at doing it better, at remembering those who are gone, and keeping a fire for their memory in our hearts. The new year promises to help us get over the year past. It's hard. It's like leaving a best friend in a house on fire. It's like having to say good-bye to your favorite pet and moving into a new mental, emotional, physical, psychological or spiritual arrangement. Some of us have separation anxiety: I do. I lost people I loved at a very young age. It seems everything that alludes to ending, and a new start , creates a sense of anxiety in me. I am sure many others feel the same way, especially if they have experienced a trauma this past year. There is nothing we can do about that. Acceptance is a virtue most difficult because it asks us to let go, leave behind what we cannot change, and start anew, plan for the future, and go on to live another year at least. There is even a certain amount of guilt going on when those who are left in the past cannot come along. Yet, it is destiny and it is part of life.....let go. What we do now is love our best, live our best, and give of ourselves with all the past knowledge and lessons of life we have come to understand within ourselves, and without those who cannot come further in our life's journey. You are not alone. You have me, you have many others experiencing this same very moment in your heart. May your new year in 2012 be as rich and warm as you remember in good times, it was. But do not forget that this year, too, shall end, and another may or may not come for you. Just go on.....and live as heartily as you can....live for all those you must leave behind, and especially live for those who are here today, and will remember you. 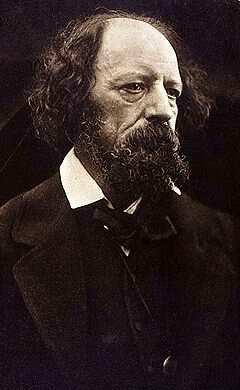 Alfred Lord Tennyson outlived most his family. He was the fourth child of 12 children, and in the 1800s life was much less glamorous and scientific, but it was much more rich in hope and a belief in God. Weigh your life, balance it with those childhood treasures that were bestowed upon you, and discard that which leaves your heart heavy. Take care to learn from someone as this Poet Laureate of the 1800s. Everything is a blessing in some way.